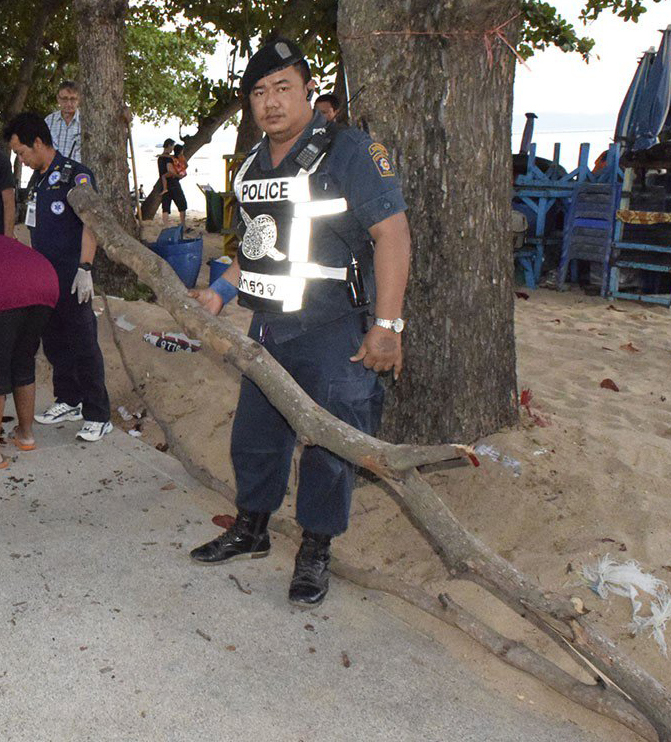 An Italian man died when he was struck in the head by a branch that fell from a tree in Jomtien Beach. Giacomo Smedile, 90, was pronounced dead on the beach at Soi 8. He was struck by a branch about three meters long and 10 centimeters thick. 90-year-old Giacomo Smedile was killed when he was struck in the head by this branch that fell from a tree in Jomtien Beach. Girlfriend Sai Silalern, 48, said they had gone for a stroll on the beach when the branch broke away, hit him in the head and knocked the elderly man to the ground. People frequently in the area said Pattaya workers often are pruning trees to prevent such a mishap, but this tree was old and parts of it are dying and falling off.